This card is permanently out of print. It is now only available as a dowloadable image here. 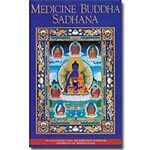 The Medicine Buddha is described as having entered into a state of samadhi called "Eliminating All the Suffering and Afflictions of Sentient Beings." 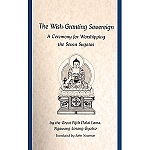 Within this samadhi, he spoke the Medicine Buddha dharani. 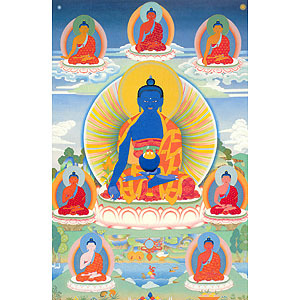 The Seven Medicine Buddhas and Shakyamuni Buddha represent the ultimate sources of healing. They vowed to actualize their prayers in degenerate times. In the center sits the main Medicine Buddha. Above is Shakyamuni Buddha. They are surrounded by the six other Medicine Buddhas.Praise to these buddhas increases the strength of medicinal therapies, the release of physical and mental suffering and closes the door to rebirth in the lower realms. 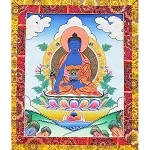 The original painting of this card comes from a large thangka painted by Nepali-Tibetan artists in Kathmandu, Nepal. 5 x 7 inches (12 x 18 cm) approx.